Weekends and holidays are a great break … a break from work, a break from school, maybe a break from lessons. What about taking a break from digital connections? People are rarely away from their phones, tablets, laptops or TVs. In the US, the number of electronic devices outnumbers the population of the country. Though these all serve to entertain, assist and connect us, is there value in stepping away? Some researchers says we, as a society, are becoming addicted to the internet. Given the stats below, I can see why. 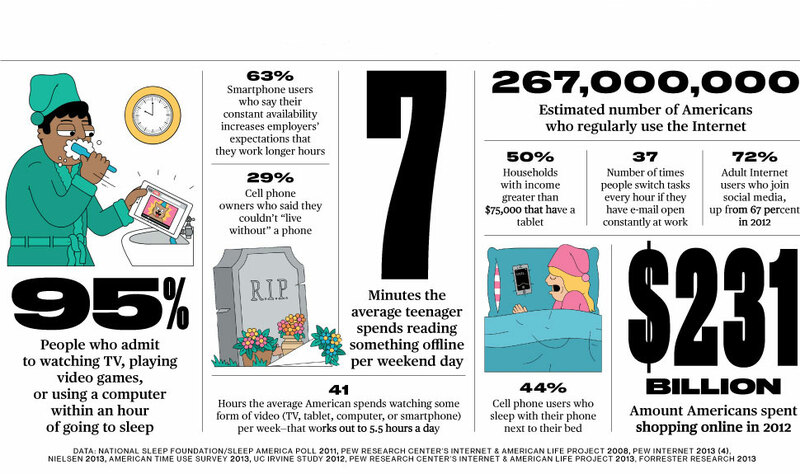 I know I appreciate the value in all of this technology, but here is some food for thought on why you may want to put the devices down for a few days or even a week. Louis CK, an American comedian, did a funny piece on how people are so worried about being consumed by loneliness that they need to be connected at all times. He says they even text at stop lights because they cannot stand to be alone. I disagree. I don’t think it is loneliness. I think people have forgotten how to entertain themselves. At first it was relieving boredom in waiting rooms and airplanes. Then it was the 5 minutes at a restaurant while waiting for your friend. Now it is a 2 minute stop light. We no longer have the ability to just ‘be’. We always have to be ‘doing’. When I was young I went to Disney World with my cousins. I remember standing in 90 minute line-ups for the rides. I also remember talking, playing games and joking around. If you go to a theme park now, what do you see? Throngs of people reading their devices. They are not lonely. They are bored. They are so accustomed to scrolling through Facebook and Instagram or playing a game on their phone that they have forgotten how to engage the person beside them. How many times have you been to an event and you notice that the teenager in the group is in the corner texting rather than talking to others? In addition to the social aspects, employers are also demanding more of their employees because they are always connected. This causes more stress and less ability to detach from work when away from the office. This has become such a problem that you can now sign up for any number of Digital Detox retreats specifically designed to teach you to unplug. 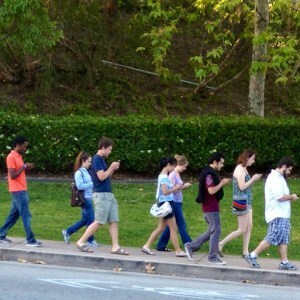 So how do you know if you are too connected or just enjoying the conveniences of modern times? I believe the first step is acknowledging your routine. What are your digital habits? Do you have too many? I will go first. Hello. My name is Cat, and I am addicted to digital. I sleep with my device beside my bed. It is my alarm in the morning. When I wake up, I usually lie in bed and check my email and my Calendar before I get up. I justify this because I may not look at my device again for 2 hours and do not want to miss an ’emergency’. After breakfast I will check my electronic todo list to make sure I know what my day holds. When I get in my car I call my mom from my cell. It is usually the only free time I have for phone calls. After I drop off the kids I use my GPS to get to any new appointments. Once I arrive I check my email again. God forbid I have missed something. I do not take my phone in to the gym! But I do take my MP3 player. They just happen to be different devices. Once home I check all my social networks, read through my google alerts, comb my favourite websites and answer both my personal and work email. Then I set to work… on my computer. While writing this, I have 10 tabs open on two separate browsers. I am using them all. Several hours later, I pick up my kids, which admittedly keeps me busy and off devices. After dinner I check the computer again. The world can change in 3 hours you know. I go to put my eldest to sleep, we watch a few science videos off YouTube. It’s educational. That makes it ok. Then I read on my iPad while she goes to sleep or do some work. My husband is busy doing the same. Then off to sleep to start my next digital day. Putting it all in writing makes me wonder how much I need it and how much I have just grown to like it. You may find that you get used to putting your device down more often and will have time for some other things. Have other great suggestions on how to detox? Share them below!